Here’s one for the “that aged well!” books. The graphic showed Acuña’s rookie numbers from 2018, compared to his 2019 numbers. Those 2019 numbers cover a grand total of six games, in which Acuña had 27 plate appearances. This is a tiny sample size in baseball. Well, Acuña immediately made a mockery of the graphic with an opposite-field home run on the next pitch. 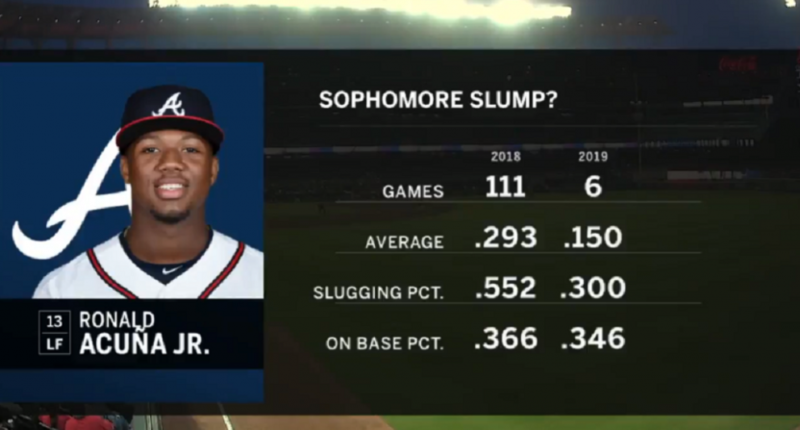 The Miami Marlins broadcast showed a graphic that questioned if Ronald Acuna was having a sophomore slump. Acuña won the 2018 NL Rookie of the Year with a monster season that included a .293/.366/.522 slash line. His .917 OPS, 143 wRC+, and .388 wOBA all ranked 12th among MLB players with at least 450 plate appearances. This was all as a 20-year-old, and with a ton of pressure as the consensus top prospect in baseball entering the 2018 season. He’s a special talent who showed it right when he stepped into the league, at the age of an A-baller. The Braves just signed him to a $100 million deal that is viewed as a bargain for the organization. So, odds are pretty high that Acuña won’t experience a sophomore slump, or at least not fall off significantly. And to suggest it after only six games isn’t a great look for an opposing broadcast, especially one covering a team with arguably the worst roster in baseball; they should probably lay off throwing shade and doubt at other teams’ actually talented players. Acuña gave the graphic what it deserved. Atlanta BravesFox Sports FloridaMiami MarlinsRonald Acuña Jr.